What is so great about Flex Fitness System? Flex Fitness System is a full body complete resistance band workout system that duplicates almost every exercise in a world class gym. Flex Fitness System is the only system that has adjustable steel buckles that work with existing gym handles. The patented steel buckle system makes for a tailor made fit for each individual and each exercise. The Flex Fitness System is compact and light, making it ideal for use at home, travel or even at the gym when your favorite machine is taken. Unlike other resistance bands, Flex Fitness System is not limited to a permanent handle. You can use the provided handles and ankle straps and even use existing gym handles. Resistance bands have been around for decades and used by top athletes all over the world. Resistance bands are a proven alternative to free weights and large expensive gym equipment. We designed a patented buckle system that brings everything together. Flex Fitness System is the only resistance band equipment that is adjustable and compatible with all existing gym handles and ankle straps. With Flex Fitness System you can perform almost every exercise known with excellent form and low impact. You will be able to target every muscle group!. Unlike machines and free weights, the most resistance is at the end of the repetition. Get the body you have always wanted! Complete full body resistance band workout / HEAVY VERSION Check Tone Flex for our lighter weight system. These are the THICK, WIDE continuous loop pull up assist bands! NOT THE WIMPY tube style bands. 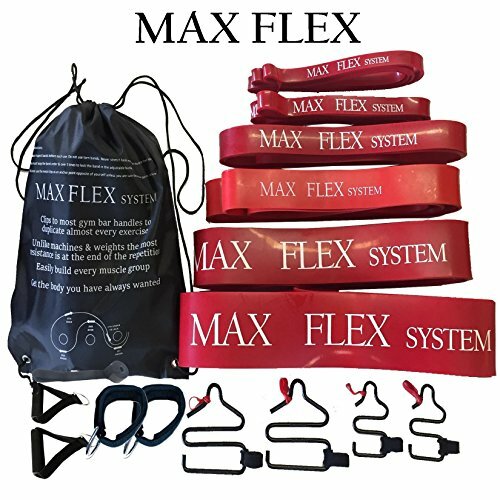 Max Flex comes with comprehensive laminated instructions, Illustrated daily workouts, ankle straps, handles, adjustment Buckles, 6 bands & carry pouch. The bands we make are the best quality and heavy duty. Sizes included are 11/16", 7/8", 1 1/4", 1 3/4", 2 1/2", 3 1/4"
If you have any questions about this product by Flex Fitness System, contact us by completing and submitting the form below. If you are looking for a specif part number, please include it with your message.